The AR-15 has been very popular with all kinds of shooters ever since its introduction. Partly thanks to the adoption of the M16 by the US military and partly due to the modular design which allows you to swap parts and customize your weapon to your heart’s desire. While the AR-15 platform is reliable and accurate, you will enjoy the ability to mold your gun for the purpose you need, such as plinking, hunting, target shooting or self-defense. In this article we will look at building your AR-15 from a kit. Building your own will help you know the gun more intimately and help highlight any future upgrades you want to make. Let's take a look at some great build kits on the market. Each one varies as to what it includes, so be sure to check closely to find the kit you're looking for. This 5.56x45mm AR-15 receiver set with a lower parts kit and stock is made exclusively for Brownell's and consists of field-proven components. The complete upper receiver comes with an M4-profile 16” barrel featuring carbine length gas system and an A2 flash hider. The common A3 flat-top upper receiver is machined from forged 7075 T6 aluminum. It has 10” polymer handguards and a KeyMod rail system. The upper receiver set comes with the ejection port cover assembly and forward assist installed. The kit also includes a standard MPI-tested bolt carrier group and charging handle made of 6061-T6 billet aluminum. A Mil-Spec M4 style carbine adjustable stock completes this set. The whole stock assembly is a mixture of aluminum and fiberglass-reinforced nylon. It is extremely resistant to impact. The most intricate part of this set is an 80-percent Anderson lower receiver. Of course, this calls for more-advanced armory-level gunsmithing. The Mil-Spec Anderson LPK (lower parts kit) includes the trigger with a hammer, a pistol grip (A2 style) and all other internals. This kit from CMMG is specifically aimed towards building the lower of your AR-15 rifle. 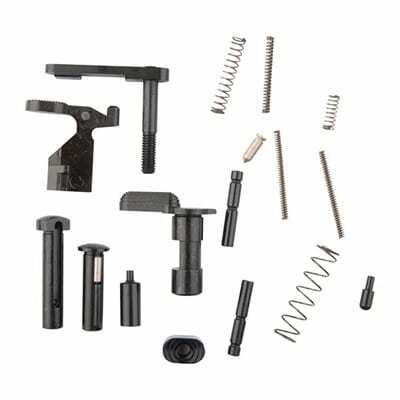 The lower parts kit includes a takedown pin, pin detent and spring (2 each), hammer, trigger pin (2), safety selector, magazine catch and release, bolt catch and plunger, buffer retainer, and all the other required pins and springs. In short, this lower parts kit is a one-in-all solution for building your lower receiver. The kit is helpful for building a customized lower, especially with a custom grip and trigger group. The finish of all the parts in this kit is very consistent and the parts have been machined to fit well. Every component in the package is separately packed and clearly labeled so you can keep things organized during installation. All parts of the kit have a matte black finish so they blend really well with the aesthetics of your rifle. All the parts in the kit are mil-spec and compatible with all lowers, so you don’t have to worry about selecting a specific type for your lower. Finally, the kit has been priced so well, you may end up buying an extra one as a backup. The Lower Parts Kit from CMMG is an inexpensive and complete solution to build your AR-15. The kit is compatible with all lowers, which is another attractive feature You can also keep one as a backup for replacing worn out parts. Recently, DPMS released its well-planned AR-15 build kit chambered in 5.56 NATO. It is intended for both first-time buyers and more experienced shooters. The Oracle kit includes everything except a stripped lower receiver, sights and a magazine. The A3-type flat-top upper receiver built from 7075 T6 aluminum comes with the ejection port cover and forward assist installed. The upper includes Glacier Guard handguards, which are generally regarded as sufficiently heat-resistant. It also includes a standard BCG and charging handle assembled at the factory. This affordable kit features 16” Lite-contour barrel made of 4140 Chrome Moly Steel and topped with an A2-style flash hider. The light "pencil profile" barrel has a 1:9 rifling twist rate. M4 feed ramps ensure reliable feeding of both commercial and surplus ammunition. The unit has a carbine-length gas system with a single-rail Picatinny rail gas block. The Oracle rifle kit sports a proprietary Pardus collapsible buttstock assembly with a commercial diameter buffer tube, carbine buffer and all necessary components to complete the construction of this introductory carbine. The Geissele AR-15 lower part set assumes that more-experienced builders usually upgrade their grips and triggers first. In that context, Geissele LPK includes all parts except the fire control group and pistol grip. 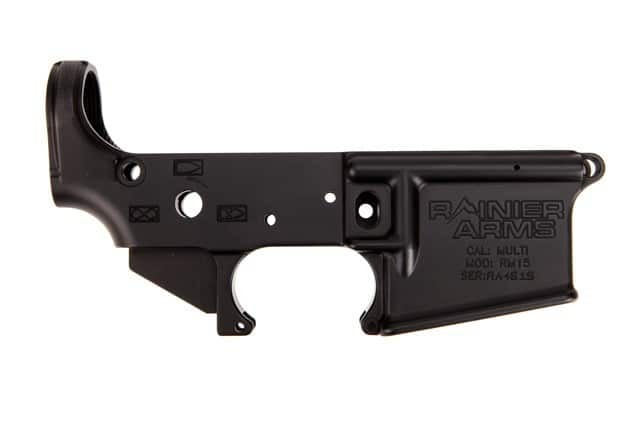 Unlike some kits that offer Metal injection molded (MIM) parts, these quality AR-15 lower components are made from hardened stainless steel or by casting process that meet or exceed military specifications (Mil-Spec). 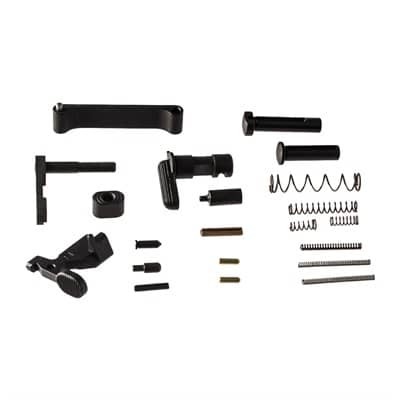 The Geissele AR-15 Lower Parts Kit consists of the bolt catch, bolt catch plunger, spring and roll pin, mag release, mag release button and spring, buffer retainer and spring, safety, safety detent and spring, trigger guard and roll pin, takedown detents and springs, and pivot and takedown pins. With 17 parts, this slightly-expanded basic set is an extremely customizable AR-15 gun builder kit. It only provides what you need without the extra parts that you're going to replace anyway. 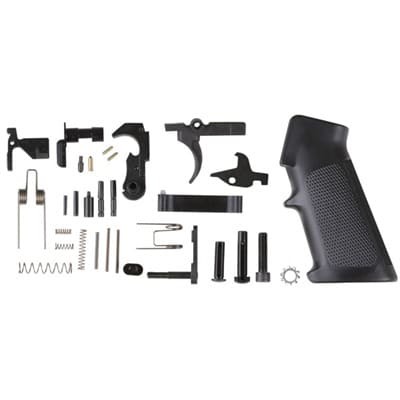 This lower receiver completion kit from Brownells contains all the parts of the lower receiver assembly you’ll ever need. The kit includes all the pins, springs, buffers, and other components for completing the lower receiver, along with a trigger assembly. In addition to that, the kit also includes a six position adjustable stock for your AR-15. The stock has been manufactured from nylon-based polymer and reinforced with fiberglass to deliver strength and durability to the structure. All the components of the kit are mil-spec and compatible with all AR-15 lowers. The buffer tube in the kit has been properly machined to match the stock interior diameter for a snug finish. The kit and stock are packed in separate pouches with proper markings to allow easy installation. This is one of the only kits on the market which comes complete with a buffer tube and a stock. Additionally, the inclusion of the buffer tube and stock n in the kit makes it more economical and saves you a lot of money, which would otherwise be spent on buying a separate stock. The parts in the completion kit fit snugly and offer good value for the money. 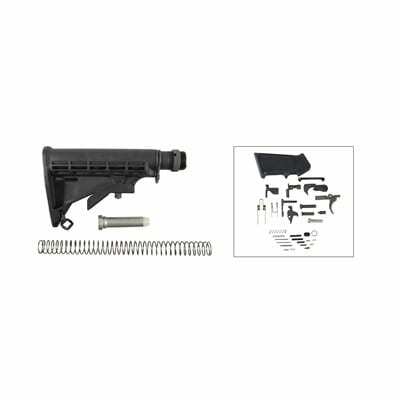 The complete lower parts kit from Brownells includes the buffer and an adjustable stock in the package, which is definitely a plus. Considering its overall price, it is a good bargain with the inclusion of those extra items. Plus, it is compatible with all AR platforms. 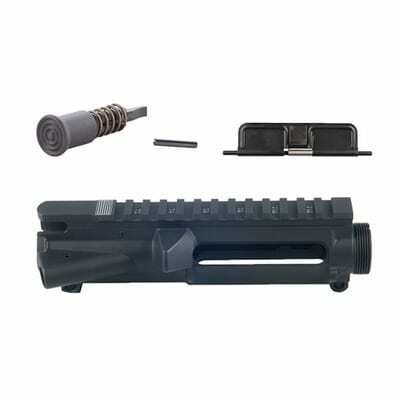 Here comes a quality upper receiver assembly kit for your AR-15. 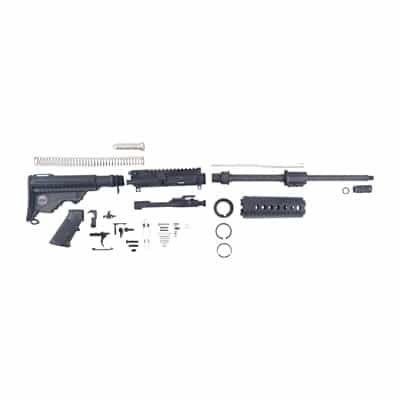 The kit includes one stripped upper receiver forged from 7075 T6 aluminum with M4 type feed cuts on the inside for reliable feeding. The receiver includes a forward assist assembly and an ejection port assembly along with the assist push-pin and the ejection port cover. 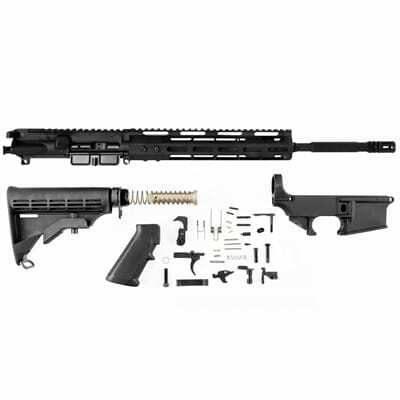 The assembly build kit is compatible with standard and mil-spec lowers and components. For your knowledge, the kit has an aero-precision upper receiver with a precise finish and compatibility with all lower receivers. The flat top upper has rails on the top to let you mount optics with ease. The upper is aesthetically pleasing and the presence of a forward assist also helps with the overall operation of your AR-15, preventing jams and cycling issues. The upper is easy to install and offers good value for the money. Additionally, the proper head spacing for the BCG is also an added advantage. The charging handle is mounted on the rear, so take note of that before buying. The AR-15 upper from Brownells is an economical, high-quality, and complete solution for building your rifle. It fits all AR lowers and has a flat top with rails. Plus, don’t forget the eye-catching aesthetics. Bushmaster Firearms has earned its reputation and popularity by manufacturing AR-15 style rifles. They also offer highly-regarded and affordable kits for this legendary rifle. The Bushmaster AR-15 lower parts kit offers a carefully-selected assortment of parts with everything you need to finish your build. However, the kit doesn't include the lower, the buffer tube, buffer and buffer spring. The Bushmaster lower parts kit consists of an injection-molded pistol grip - a classic A2-style grip and same type of high-density polymer trigger guard. The set comes with a single-stage trigger featuring typical military- or tactical-rifle heavy trigger pull. The rest of the internal parts are based on Mil-Spec allowing you to complete or refurbish a stripped AR-15/M16 receiver. This set of components has a uniform surface treatment with an average finish and quality. The main parts of the AR-15 are related to the accuracy and reliability of your gun. The more comfortable you are with your gun, the better you will shoot with it and the more accurate it will be as a result. Being especially mindful of some of these pieces will help you build a more reliable gun. The upper receiver or lower receiver of an AR are the central pieces of your rifle and the keys to the AR’s modular system. Most receivers will work on any AR but buying an upper/lower pair from the same company will typically eliminate any issues in fit and finish. Receivers come in various finishes and looks, but popular options are polymer and aluminum. You should choose a high-quality build material to ensure your weapon will take any punishment that will occur as a result of normal use. Forged lower receivers are the most common type of lower receiver on the market, while billet receivers are less common and more expensive. The way you hold your gun while shooting can make or break your shot. Because the grip is your personal connection to the rifle, it should feel natural in your hand, as if it’s an extension of your arm. Any discomfort you feel from the grip, whether due to protrusions, sharp edges or the wrong size, will impact your shooting. If your hand is large, consider changing the stock grip for a larger one that feels like it was made for you. A number of great grips are available and you can choose the grip that feels just right for you. The typical grip for an AR-15 is the pistol grip, but in some states like California, they are prohibited. Featureless grips can help you satisfy the legal requirements in those states. By getting a new handguard, you cannot only improve the rifle’s aesthetics, but also the comfort, accuracy and versatility of mounting accessories. The handguards come in various types, such as free-float or drop-in, and with or without rails. They can be made from a variety of materials. Free-floating handguards not only look good, but they offer slight increases in accuracy over traditional two-piece drop-in designs. Free-floating handguards also offer plenty of space to attach accessories via their MIL-STD-1913 rails. If you’re planning to use the AR-15 for hunting for example, you’ll appreciate the ability to add a night vision device, extra optics and a holographic sight. On the other hand, drop-in handguards are much easier to install or swap out. The most common handguard lengths are rifle, mid-length, carbine and pistol. Generally, you should match your handguard to your gas system length, but you may be able to fit a longer handguard on a shorter gas system if you use a low-profile gas block. The barrel affects the weight and overall performance of your rifle. A lined barrel such as chrome, Melonite or Nitride coatings will add to the life of the barrel and extend the life of your barrel by over 5000 rounds fired. Even for the more expensive ARs, over time the accuracy of a barrel can decrease as a result of thousands of shots. The AR-15’s barrel has a lifespan of between 10,000 and 20,000 rounds, after which most show a serious loss of accuracy. Another factor to consider is the twist rate of the barrel as this will determine which bullet will perform best in the rifle. If you’re planning to use longer or heavier bullets, you’ll require a fast twist rate such as 1:7. For lighter bullets (55 grain or less), use a slower twist rate. For a wider range of bullets, the 1:8 or 1:9 twist rates will work fine. Some AR-15s come with great triggers but some don’t. The same is true for build kits. The standard mil-spec trigger sold on many AR-15 rifles works fine for some people. But when building your rifle, look carefully at what trigger is included or if you want a new trigger to improve your accuracy and make every shot a pleasure. You might opt for a drop-in trigger, which makes it really quick and easy to install a new trigger. A single case houses all of the trigger’s internal components, such as the trigger, sear, hammer, springs, and disconnector. Once you remove the old trigger, installing a drop-in trigger is as simple as dropping the case into the lower receiver and securing the trigger case with your trigger pins. The charging handle is used to move the striker, bolt or hammer to the ready position, so it’s an integral part of the AR-15. Other uses include ejecting unfired rounds and spent shells, checking the gun for blockages and rounds, and releasing bolts that have rear-locked. One reason many shooters upgrade their charging handles is that the stock handles are designed for right-handed shooters. If you’re left-handed, consider an ambidextrous charging handle that you can use with either hand. Shooters in tactical situations love ambidextrous handles as it can be used for quick, accurate shots from either side. You can choose from a variety of materials, colors and features for your new charging handles. Some even reduce the effect of blowback by porting gases in a different direction. Stocks come in two main type, fixed and collapsible. While fixed stocks are sturdy and great for precision shooting, there are also many collapsible stocks that have a good-enough fit to offer both accuracy and adaptability. In order to allow different-sized shooters to comfortable shoot your rifle, you’ll need a collapsible stock. A collapsible stock also comes in handy for shooting while wearing armor, and is useful for urban fighting and crowded areas. A folding stock will be very handy for reducing the profile of your rifle while transporting it in a bag or for storage. A folding stock will need an adapter for the AR-15, as the standard AR buffer tube/receiver extension system prevents the use of a folding stock. Whatever stock you choose, you should match the fit to the right size of the buffer tube, whether it’s commercial or military spec. Most AR-15s cycle through a gas impingement system. An adjustable gas block helps to better regulate the cycling action. This lowers the felt recoil and barrel rise as well as other annoyances as you shoot. Some shooters might want to try out the alternative gas piston system, which has advantages and disadvantages compared to direct impingement. It’s far less common, though, so you may have trouble finding it in a build kit. The AR platform is ideal for customizing, so it makes sense to upgrade the weapon with the best optics or sights you can afford. Optics can make a huge difference in your accuracy and allow you to see your targets precisely. Of course, there are a ton of scopes out there, including red dots, holographic sights and hybrid sights. Some are geared towards nighttime shooting, some have very high magnifications and others are equipped with fancy reticles that take into account bullet drop. But your scope isn’t going to be part of a build kit. You should know what you plan to use the gun for before investing in a scope. 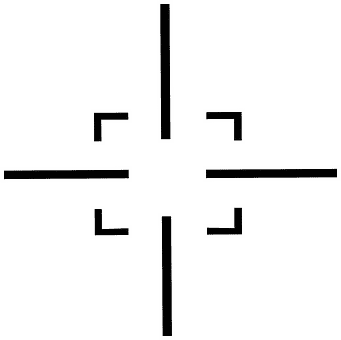 Holographic sights place a reticle on your target with a laser, helping you to acquire the target. They are lighter and allow a larger field of view compared to red dot sights, which use an objective lens with a partial mirror coating. Red dot sights come in both tube-body and head-up styles. 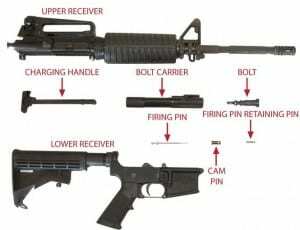 An AR-15 is among the simplest rifles to assemble. Building an AR-15 doesn’t require a lot of expertise or complicated tools. If you are a bit familiar with disassembling or servicing a firearm, it will not take more than ten minutes to build an AR-15. The rifle is mainly comprised of two parts, the upper receiver and the lower receiver. All other components just fit into these two. The best procedure is to begin with the finished lower receiver. Begin by placing the lower receiver on a vise and installing the magazine catch, followed by the bolt catch, pivot pin, safety selector and pistol grip. Next comes the trigger assembly, which includes the trigger, hammer, and the trigger guard. Once that is done, install the buffer tube and take down pins. You can also dent the castle nut of the buffer tube with a punch and hammer for extra caution. Now, move onto the upper receiver, and install the ejection port cover, forward assist, barrel, gas block, and handguard, followed by the bolt assembly. Once the lower and upper receivers have been completed, install any other accessories like mounts and suppressors. Make sure to lubricate all the parts after each step of the assembly so the rifle functions properly. In case you want a detailed manual of instructions, please refer to the video mentioned below. When it comes to customizing your AR-15, keep in mind the purpose you will use it for and plan accordingly. You should try to address any comfort or ergonomic issues with the grip, trigger and hand guard by upgrading to the best fitting accessories you can find. High-quality magazines and sights can also make a big difference in your shooting experience, as you can reload faster and more reliably with good magazines and shoot more accurately with the right scope. Building an AR-15 from a build kit is a great way to learn more about the workings of your rifle. It also provides a high level of satisfaction through knowing you’ve done it yourself!